A skater glides along the rink at the Boston Harbor Hotel. This 2,900-square-foot rink is open to both hotel guests and the public. Are you a frequent skater? Take advantage of season passes. Or do you need to brush up on your skills? The rink offers skating lessons. Skate rentals and refreshments, including hot chocolate and hot apple cider, are available at the rink. You can also book a private event, including birthday or holiday parties or corporate functions. Hours: Monday through Friday: 4 to 7 p.m.; Saturday and Sun: 10 a.m. to 6 p.m. Many of today’s rinks are constructed in retail environments, where companies hope to play off ice-skating nostalgia to help drive business. Boston Common’s Frog Pond is located within the country’s oldest public park. Need a break from showing off your skating skills? Head over to the heated umbrella, where you can grab a hot chocolate and Belgian waffle, take a seat, and watch the skaters glide by. Hours: Monday, 10 a.m. – 4 p.m.; Tuesday through Thursday, 10 a.m. – 9 p.m.; Friday and Saturday, 10 a.m. to 10 p.m.; Sunday, 10 a.m. – 9 p.m.
Fenway’s outdoor ice skating rink is back this year, and the Mayor’s Community Skates for Boston residents is scheduled for late December/early January. 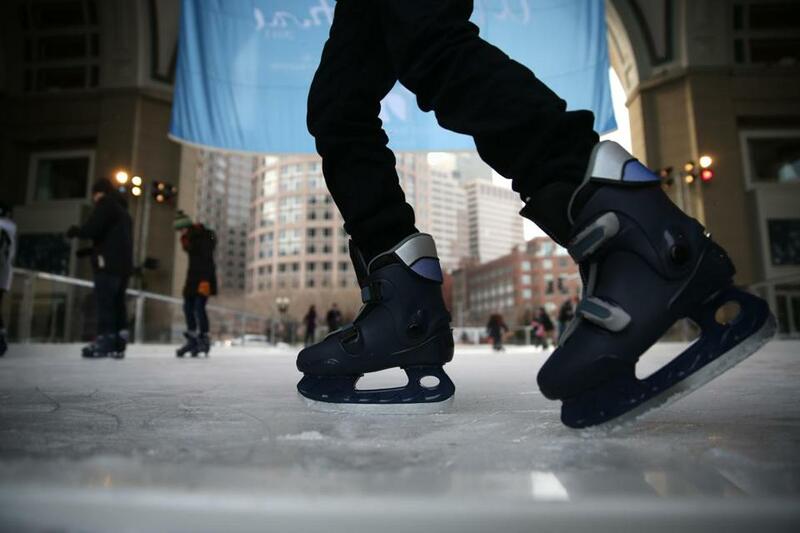 On Dec. 29 and Jan. 1, there will be a public skating day, free for all Boston residents. And for the first time, Fenway will also feature a “Monster Sled,” a 20-foot high sledding and tubing ramp. 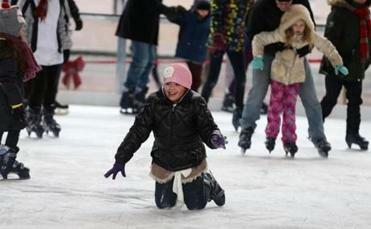 Rentals are not available at the rink, so you will need to bring your own skates. All skaters will be required to sign a waiver, which is available online at boston. redsox.mlb.com, or upon arrival at Fenway. Located within Brookline’s 64-acre Larz Anderson Park, this rink offers skating lessons and rink rentals for private parties. Hockey fans: The adult men’s hockey league plays Tuesday and Thursday nights under the stars. Contact the league president for details. Hours: Tuesday and Thursday, 9:30 to 11:30 a.m.; Friday, 8 to 10 p.m.; Saturday and Sunday, noon to 5 p.m.
Glide along to the songs of Motown emanating from the speakers at the Peter J. Kelly Skating Rink in Jamaica Plain, which is open to the public. There’s no traditional snack stand at the rink, so grab a cup of hot chocolate before or after your skate at a nearby café to warm yourself. Hours: Sunday to Friday, noon to 7:30 p.m.; Saturday, 1 to 7:30 p.m. Located in the heart of Kendall Square and surrounded by a courtyard, this rink offers skate rentals, lessons, and a snack bar with hot drinks and snacks. Private rink rentals and group outings are also available. Skaters beware: The rink’s unique shape takes a little getting used to. Hours: Monday, noon to 5 p.m.; Tuesday to Thursday, noon to 8 p.m.; Friday, noon to 9 p.m.; Saturday, 11 a.m. to 9 p.m.; Sunday, 11 a.m. to 6 p.m. Whether you are a beginner or an expert, this 60-by-140-foot refrigerated rink is ideal for recreational skating. Skate rentals, snacks and beverages, and bathrooms are available. Take a break from your shopping at Patriot Place and hit the ice. Hours: Monday to Thursday, 4 p.m. to 9 p.m.; Friday, 4 p.m. – 11 p.m.; Saturday, 11 a.m. to 11 p.m.; Sunday, 11 a.m. to 9 p.m.
Find listings for Mass. Department of Conservation and Recreation rinks at the Mass. DCR website. According to the website, the agency operates 42 rinks across the Commonwealth, from Plymouth to North Adams, including many in the Boston area. Meghan Colloton can be reached at meghan.colloton@globe.com. Follow her on Twitter @BostonMeghan.